What questions do interpreters ask of Scripture and how have those questions changed over time? History of Biblical Interpretation starts at 150 BCE and moves to the present in exploring the major developments and principal approaches to interpreting the Bible. Thirty-four chapters survey the most significant methods and provide introductions to the prominent people who exemplify them. Each chapter also presents an original document that demonstrates this person's interpretational approach and includes a reference bibliography for further reading. Whether used as a textbook or in individual study, this excellent introduction to the history of biblical interpretation will open new doors for students of the Bible, theology, and church history. ^"Yarchin's History of Biblical Interpretation provides students, scholars, and interested lay readers with a sorely needed collection of writings devoted to the interpretation of biblical literature from Greco-Roman times through the present. Unlike other works, this volume does not simply discuss the history of biblical interpretation. Instead, Yarchin presents the reader with a virtual cornucopia of examples from the extraordinarily rich history of biblical interpretation in both the Jewish and Christian traditions. The volume includes examples from the Dead Sea Scrolls, Philo, Justin Martyr, Augustine, the early Syrian Church, the Jerusalem Talmud, Saadiah Gaon, John Calvin, Moses Mendelssohn, Hermann Gunkel, Brevard Childs, Jon Levenson, Phyllis Trible, and many more. Yarchin's volume will become an indispensable textbook and resource for all concerned with the interpretation of the Bible." 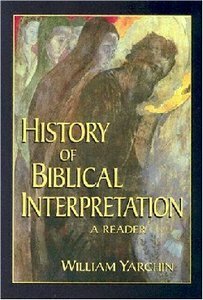 About "History of Biblical Interpretation"
William Yarchin gives us an excellent introduction to the history of biblical interpretation that starts at 150 B.C.E. and moves to the present. This reader provides original texts as examples of the major developments and principal approaches to interpreting the Bible. It also introduces these methods and the authors who exemplify them. Bibliographic references direct students to further resources. Book jacket. William Yarchin, Ph.D., an APU faculty member since 1993, is an associate dean for the Division of Religion and Philosophy for the School of Theology. He teaches courses in Biblical Exegesis and Interpretation. Yarchin's scholarly interests revolve around the intersection of science and religion and the history of biblical interpretation. Lecturing on these topics have taken him to Canada, Israel, and Sicily. A member of the Society of Biblical Literature and the Catholic Biblical Association, Yarchin recently published a book on the history of Biblical Interpretation. Prior to teaching at APU, Yarchin served as director of the Ancient Biblical Manuscript Center in Claremont, California.